Sometimes collaborations just work, spawning a wealth of releases between artists, and such is the case with Landis and Crespo, two young electronic producers who come together again on today's track. Both got an early start in dance music: Landis at 13 when he started DJing at an art gallery, and Crespo at about the same time when his sister handed him George Acosta's Awake album. From there it's history, the most recent milestone being the summer hit, "Mojo", a grinding progressive house track off Cr2 Records. 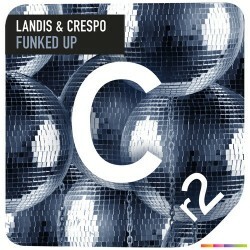 Today they return to the esteemed imprint with their December 17th release "Funked Up", which aims to give their other releases a run for their money. At first I feared an all too common big room track from the pair, but the song brings something new to the game, as hollow percussion mirrors the gritty mid line, culminating in a refined drop where the grind twists in an almost jazz improv manner. Landis: Stop eating Frozen Pizza, cut back on the coffee consumption and get a top 10 track on Beatport overall. Crespo: I really gotta stop eating jellybeans and sour patch, its my studio food but I eat way too many. I would ultimately love to have an official remix release and originals on some of my favorite labels such as Rising, Mad Decent & Revealed. Hannah Wants returns with the unstoppable "Dot Com"